Tabitha works to build wells and ponds to provide water for drinking, bathing and washing, as well as for animals and to irrigate crops. Unfortunately, during the Pol Pot years, most wells were destroyed. Tabitha is currently providing 80-100 new wells per month throughout Cambodia and wishes to increase this number as much as possible. Each well serves 3 – 5 families, whilst field ponds and wells serve a larger community. These impacts are extraordinary for their immediate and long-term effect on our families. The cost of each well for materials and drilling is only £150.00. For each well purchased you will receive a photo of your well and a certificate. Email Tabitha UK or purchase online through MyDonate. “The impact of these wells on our families is immediate and significant. The first, very noticeable impact is the decrease in the incidence of diarrhea and skin infections in the families. Within weeks, children and adults gain weight; their skin tones and eyes lose that haunted, dry look and their ability to work increases by several hours a day. Drinking water: In areas with no safe wells, drinking water is taken from open ponds or rivers which may be polluted with excreta or chemicals. Villagers (and most importantly, children) often develop diarrhoea and other serious infectious diseases. The average distance to walk to a safe water source is 3 kilometres. This means that several members of the family are required to wake at 4:00 am to walk to a water source and then wait their turn for water – usually 3 to 4 hours. This precludes a number of children from attending school. Since a person is only able to carry several containers of water at a time, most family members are still unable to wash on a daily basis. Irrigation: Crops, especially rice, are grown during the wet season. However, it is so dry during the dry season that crops cannot be grown unless extra water is available. Families with wells are able to grow crops year-round. 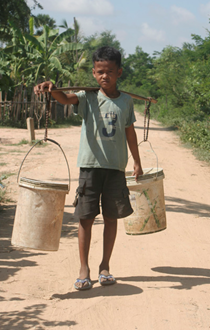 Several types of wells are used in Cambodia – the type used depends on the nature of water available. A pipe is bored 50-60 metres down to the water table and a hand pump is used to pump water to the surface. A cement apron is placed around the well. Tube wells supply water for 5 families (40 people). A 10-15 metre hole is dug and cement pipes are used to keep the well open – these rise more than 1 metre from the ground. 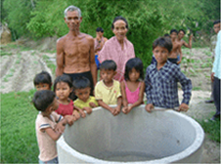 Tops are placed over the well to prevent pollution, and villagers are taught about keeping the well clean. Open wells supply water for 5 families (40 people). Field wells are constructed in the fields where crops are grown; sometimes well away from the family’s home. Each well typically supplies two families with enough irrigation water to grow crops year round- an average of 2-3 hectares of land. As with tube wells, a machine drills down into the aquifer and a plastic pipe is installed, allowing water to be pumped to the surface. Families then either save for a petrol-powered pump or rent a pump from a villager who has one. Family field ponds are used in areas where the water table is dispersed. In these areas water seeps up through the soil, providing a constant source of fresh water. Family field ponds fill by seepage from the water table and provide household water and water for irrigation – on average – 2-4 hectares of land. These are about 10 X 7 metres and about 3-4 metres deep. They supply several families with drinking and some irrigation water. Providing safe and reliable water is a vital part of the Tabitha Family Savings Programme. Tabitha gives 85% of the funds required for each new well – the families provide the balance via the savings programme.